Our dry early spring and late planting brings us a bonus in our fall harvest…lots of beautiful peppers, sweet ones, spicy ones, beautiful colored ones. This versatile recipe works for any combination of peppers. Just adjust the recipe overall for quantity, and adjust the hot paprika depending on the heat of the peppers you use. The original recipe used all sweet bell peppers. Today I made them with two of our sweet yellow bell peppers and seven of the spicy Anaheim peppers. Rub the peppers with oil, and run them under the broiler, turning them as needed, until browned and wrinkly all over. Don’t over cook — you want plenty of pepper flesh. Thinner peppers finish quickly. Peel the peppers, remove the stems (don’t worry about the seeds – they make a nice garnish and add nutrition and flavor), and cut into lengthwise 1/4″ strips. Cut across the lengths into 1″ pieces. Add seasonings, stir, taste and adjust seasonings. Enjoy! Pan roasted summer squash with a vegan mayo/Tahina sauce and pine nuts with za’atar. Black bean salad with black beans, red bell peppers, cilantro, red onion, extra virgin olive oil, white Balsamic vinegar, salt and pepper — and topped with pan roasted summer squash and those beautiful cherry tomatoes. Zucchini dip Middle Eastern Style with garlic, fresh herbs (I used 1/4-1/2 cup parsley and mint here), fresh zucchini (1-1/2 lb. ), lemon juice (1/8 cup), tahina (1/4 cup), Kosher salt (1/2 tsp), 1/4 – 1/2 tsp hot paprika, extra virgin olive oil garnish. This post was published in Bob’s Fresh and Local newsletter 8/23/2017 under a different title. Hopefully you’ve had fun with “greenies” (smoothies with loads of greens) over the summer with all that gorgeous kale coming from Farmer Bob. Here’s another way to think out of the box about breakfast. Put away that boxed cereal, and learn to make an Israeli-style breakfast! This is the perfect time of year to give it a try, when the cucumbers and tomatoes weigh down the vines and fill our CSA boxes. 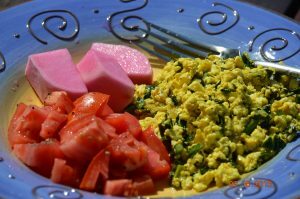 Israeli breakfasts feature a salad of cucumbers, tomatoes, peppers, onion and perhaps cilantro or avocado, dressed with olive oil and freshly squeezed lemon juice. Other typical components of the meal are soft cheeses, hard-boiled eggs, smoked fish, pickles, olives, bread and even hummus (a chickpea “dip” — I shared that recipe a few weeks back). Although not necessary if the salad is eaten immediately, deseeding tomatoes extends the time the salad will last without drowning in its own juices. To deseed, quarter the tomatoes, scoop out the seeds and pulp (set aside). Cut the tomato flesh, cucumbers, pepper and opt. avocado into a uniform 1/4″ dice. Chop the onions and cilantro. Add extra virgin olive oil, the juice of a lemon and salt and pepper to taste. VIDEO #1: For a demo of the dice, see the fun video my son created of himself preparing Israeli Salad in my cafe (mandolin optional – I do it by hand): http://m.youtube.com/watch?v=bzEcBa9bzu0. Hold onto that tomato pulp! I combined it with the pulp that I scooped out of the summer squash when I stuffed them and made this beautiful soup by cooking the pulp in a pot with a cut up onion, peeled ginger root, salt and hot paprika. When the veggies were soft, I pureed them in my VitaMix and at the last pulsed in some of that beautiful basil we received in our boxes (and which we’ll enjoy again this week. This is a variation of one of our favorite soups!! Last but not least for this week, my favorite way to eat snap beans, Moroccan-style Beans, also using the tomatoes arriving to us straight from the fields of Farmer Bob. I shared this recipe last year but simplified it a little this year. Prepare a quart of beans by washing and cutting into 2″ pieces. Add extra virgin olive oil to a pot with a cover, and saute minced garlic — lots if you love it, scapes if you have any left. Add at least 1/2 minced onion and saute. Add prepared beans and 1-2 good size tomatoes, petite diced. Bring to simmer, turn down heat, cover and let cook until beans are tender. Check occasionally to be certain there is enough liquid in the pan from the tomatoes to cook the beans, adding a little water if necessary. Toward the end of cooking time, stir in 1-2 rounded TB tomato paste, 1 tsp. salt, 1 tsp. cumin and 1/4-1/2 tsp. hot paprika. Cover again and simmer a while longer until flavors blend. When finished, squeeze in fresh lemon juice if you like. Enjoy! The colors are coming, the colors of summer, sunshine on a plate, beautiful and strong…corn, summer squash, multi-colored beans, carrots, chard, fennel and more. But the most beautiful color of all, the deepest and richest…beets! Beet Couscous. I didn’t get to this dish until a week after we got our beets in our boxes, but I can’t resist sharing this picture of couscous cooked up with matchstick beets and sweet onion, a bit of salt, cumin, hot paprika, some extra virgin olive oil and a splash of freshly squeezed lemon. I added Clementine wedges toward the end of the cooking time and a mint garnish — which could easily be minced and part of the seasoning. Oh, and some broken walnuts. Just as beets turn my pickled turnips into the most beautiful color, so with the couscous. I use whole wheat couscous (a pasta), by the way. The one that I buy locally in the Middle Eastern section is called Maftoul, and they make a lovely whole wheat version that cooks up in no time according to the box directions to add to the beets and onions. Navy Pea Bean Salad with Dill & Lemon. The beet salad contrasted nicely with another dish I took to a party this weekend, one of my favorite summer salads topped with roasted summer squash, Navy Pea Bean Salad with Dill and Lemon. I did treat myself to the luxury of getting some fresh dill to add to my cooked beans. That minced dill (lots) with freshly squeezed lemon juice (lots), some extra virgin olive oil, chopped red onion, salt and a bit of hot paprika make a simple but so delicious and nourishing entree for me — or one among several salads I’ll enjoy through the week. The trick is not to overcook the pea beans. Sauté the minced garlic in the olive oil, add the petite diced tomatoes, tomato paste and other seasonings and simmer for a short while. Add the prepared beans, stir, cover and cook for about 30 minutes, less for very fresh, tender beans. Then stir, replace the cover and cook another 30 minutes (or less if beans are tender), and adjust the seasonings to taste. Mixed Greens Salad. Last but not least, my salad the day I get home from working at the farm. Our fresh greens with some remaining radish, red cabbage and cucumber dressed with extra virgin olive oil, lemon juice, salt and some crushed red pepper…sitting out on my deck enjoying the day and my simple meal, reminiscing about a beautiful (if hot) day out in the fields planting and weeding and harvesting. Oh my. So I’ll end with calling your attention to these amazing colors once again. In the winter we have to look a little to find color. In the summer, our senses are flooded — not to mention the way these colors announce their healthy benefits in every bite. It was fun to have so much variety last week and even more variety this week. I thought I might share a few things I made as well as what I plan to make with this week’s veggies. Some of these things aren’t recipes per se but just “throw-in-what-you-have” type dishes. Beets. See the recipe I shared earlier for a great beet salad!! I sometimes make beet soup with these as well, a simple purée of peeled cooked beets, onions, a bit of ginger and seasonings. Cauliflower & Broccoli. I didn’t make them this time, but maybe next week I’ll include recipes for a spicy Middle Eastern style Cauliflower and Chickpeas…or for Cream of Broccoli Soup. Chard. We’ll probably get this again soon. I made something inspired by “koshari,”, a popular Egyptian dish, a layering of pasta, chickpeas, black lentils, rice, and a richly flavored tomato sauce with petite diced tomatoes and lots of garlic. I had an extra layer of sautéed chard and onions. I topped it off with a garlic scape garnish. Cucumbers. I made a beautiful Israeli/Jerusalem Salad with these. I’ll share a recipe at a later time. Fennel. This week we’re getting Bulb Fennel, such a wonderful, flavorful veggie. While I was still in the cafe, I made up an absolutely delicious Fennel Salad to go with Dill Potato Salad and No Meat Loaf (a chickpea base). The Fennel Salad is on the upper right corner. It is made up from the fennel bulb, sliced, some sliced tomato, sliced red onion, minced fennel top, extra virgin olive oil, freshly squeezed lemon juice, salt and pepper. The fennel brings unique flavors and texture to the salad. Kale. Kan’t get enough of them!! Smoothies!!! Huge ones! Every morning!! The smoothies — or better yet, Greenies, I make for Andy and me pack a wallop of nutrition and help us start the day super-charged. Would you believe, I make a half-gallon — and we each enjoy a full quart of this nourishing breakfast. Summer squash. I do many different things with summer squash, but when I have a lot coming in fast, I usually end up making a quick and easy soup. This week I had leeks left from last week so put some extra virgin olive oil in the pan, added cleaned and sliced leeks, petite diced peeled potato (more or less depending on how thick you want it), petite diced summer squash and garlic. My veggies came to about one gallon. I sautéed them for a bit and added 6-8 cups of water (to barely cover). I added a TB of salt to start and 1/4 tsp. hot paprika. I simmered until everything was soft, then ran on low in my blender. You can adjust the thickness to your liking between the amount of potato you use and the amount of water. I put it all back in the pot, added 2 cups of any kind of unsweetened milk (I used rice milk), brought back to simmer, added in some snipped rosemary and turned off the heat. You could replace the rosemary with any available seasoning…like fennel? Alternatively…squash Napoleons? If you’re still looking for ideas, check out my page in Pinterest, where I go for inspiration. My files are under LeslieCooks. My favorite time of year…no, my other favorite time of year. Published this week in my CSA Newsletter, Bob’s Fresh and Local. This is my favorite time of year, when all the beautiful summer veggies come from the fields into my kitchen. Oh, wait, I think I said that about early spring and the first greens. OK, ok, I just love the whole year in any year that I can have a part in bringing beautiful veggies into the world. I saved my summer squash from last week, so with what’s coming in this week, I’ll have plenty to make a soup to share. This squash soup is a lovely recipe with a very slight sweet flavor. 1. Cut up summer squash into cubes, and cut corn kernels away from the cob. Mince the garlic and finely chop the shallots or leeks. 2. Add some extra virgin olive oil to the bottom of a soup pan. 3. Saute the garlic and shallots or leeks. 4. Add the veggies and water to just barely cover, no more than 2-1/2 cups. 5. Return to simmer, add seasonings (I usually bump them up). 6. When done, pulse soup in a blender, preserving texture. 7. Pour back into the pot, check and adjust seasoning, and hold warm. 8. At serving time, garnish with jalapeno slices and/or sour cream or yogurt. Drizzle a little extra virgin olive oil over the surface. I originally found this recipe at loveandoliveoil.com. I’ve used it many times with groups, and it always gets great reviews! I usually at least double it and bump up the seasonings a little. We’ll enjoy cucumbers again this week as well. Of course, anything you don’t use right away can be pickled. Last week I pickled the rainbow chard stems along with a garlic scape (if you love garlic flavor, these scapes deliver a powerful punch). Can’t wait to see how that comes out! The cucumbers this week can also be pickled — just use the recipe I provided for refrigerator pickles. But here’s another way to try them, and it’s delicious! A Hungarian friend shared her recipe with me many years ago — would you believe more than 40? It dropped out of my recipe repertoire somehow because I’ve just been doing vegan recipes. Sadly, I will have to wait on this one until Perfect Day perfects its milk, which they promise will have all the properties of cows’ milk but without using a cow. I’ve already translated most of my former cafe recipes. Lots of yummy salads! The Creamy Cucumber Salad is at 5:00 in the right picture. 1. Mix the deseeded thinly sliced cucumber in a bowl with the salt and minced garlic (or garlic scape). 2. Cover and refrigerate for at least one hour, overnight if you wish. 3. Remove from refrigerator and drain accumulated liquid, squeezing it from the cucumbers. 4. Return drained and squeezed cucumbers to the bowl. Mix with sugar and white vinegar. 5. Cover and refrigerate for at least another hour. 6. Remove from the refrigerator and drain accumulated liquid, again squeezing it from the cucumbers. 7. Return drained and squeezed cucumbers to the bowl, and fold in Middle Eastern Labne. Greek yogurt, preferably full fat, makes a good substitute. Just two weeks ago, our beautiful yellow summer squash was a small yellow flower. I’m excited to know that we have garlic scapes coming through again this week along with Bok Choi, kale, cabbage and Swiss chard, all favorites among my family and friends. My son makes a dynamite chard omelet for us all every Sunday as part of our traditional shared meal (and why not — he grew up on them!). Last week I made garlic scape pesto, and it was so good I’m looking forward to trying it again this week to slather on homemade bread or mix into pasta. Bok choi I like to chop roughly, keeping the stems separate from the leaves. I stir fry the stems with loads of onions, green onions if I have them, thin-sliced regular onions otherwise. I add in the leaves for a moment and season. It’s a delicious part of lunch for me. Alternatively I add carrots Julienne to the stir fry and cook up brown Basmati rice to add to the mix with Asian seasoning. The peas coming in this week will also make a nice addition to that stir fry or to salads. Here’s a delightful kale salad with a light, slightly sweet, slightly salty flavor. This recipe is from Israeli Chef Yotam Ottolenghi, and Palestinian Chef Sami Tamimi, co-owners of stellar restaurants in London and co-authors of some beautiful cookbooks. Note: Instead of steps 1 and 2, especially if I am short of time, I make a dressing of the olive oil, juice of the lemon and seasonings, drizzle it over the kale and toss in. 1. In a medium bowl, combine kale and olive oil. Sprinkle with salt. Using your hands, massage kale until olive oil coats the leaves and they begin to wilt, about 1 minute. 2. In a small bowl, whisk lemon juice, cumin and turmeric. If you like these seasonings, you can add more, but begin with the recommended amounts. Add mixture to kale and continue to massage the leaves until well combined. 3. Add carrot, apple, raisins, almonds, olives, and toss until just combined. Season with salt and pepper. Let the salad rest for 10 minutes, then serve. Great to spread on bread, and in thinking up a title, it occurred to me it could make a great “sauce” for cabbage steaks. Crushed red pepper, 1/2 tsp. Cut up the scapes and process them briefly in a food processor. Add all leaves and pulse until even and granular. Add everything else and pulse, then blend, to uniform texture — but do leave texture. When plated, top Middle Eastern style with a little additional extra virgin olive oil for garnish. Published in Bob’s Fresh and Local CSA Newsletter, 6/28/2017. I hope everyone is enjoying the greens of summer as I am. I used every single leaf this week, every green turnip top, every spinach leaf. My husband, Andy, who isn’t big on eating his spinach, looks forward to the greens-packed smoothies I make him every morning. Today I used kohlrabi greens. “Greenies” are our new regular breakfast, and I’m looking forward to greens during the winter from Farmer Bob’s new greenhouse. This week we’ll see lots of other colors in our Meal Boxes as well: bright orange carrots, purple and white kohlrabi, deep ruby beets. I sampled a beet this past week, and it was the perfect addition to a big jar of Middle Eastern style pink pickled turnips. You’ll find that recipe in last week’s newsletter. I confess it was hard to get enough turnips to fill my jar, though, because I kept nibbling those tender, crispy, spicy nuggets. Here’s another Middle Eastern favorite, Moroccan Beet Salad. You’ll find some version of it in many Moroccan Jewish cookbooks. I used to serve this one in my cafe, and even those who inexplicably didn’t like beets were addicted to it. I love it because it doesn’t use added sugar, just lets the delightful, sweet natural flavor of the beets come through. Our beets will be smaller than I originally used with this salad, and we’ll probably have fewer, so adjust the recipe accordingly. Place whole, unpeeled beets in water to cover, bring to a boil, reduce heat to simmer, and cook until done. Don’t over-cook, but you should be able to pierce the beets easily with a fork. Cool the beets in the cooking juices and rub off the skins. Add olive oil, lemon juice, spices. Slice onions thinly into the bowl with the beets, 1″-2″ long slices. Add chopped cilantro to the bowl. Stir all together gently, adding lemon, salt and hot paprika to taste. Of course, these young beets at the early end of the season are so sweet and tender that you can just use them raw in salads. The same high-powered blender that makes your delicious greenie will also make an extraordinarily beautiful ruby red soup or smoothie. Finally carrots, beautiful orange carrots. Another time, I’ll share some great carrot recipes, including Moroccan Carrot Salad. I also like to make a creamy carrot soup without an ounce of cream — it’s amazing what a blender will do! But I’ll end as I began, with smoothies. Of course, I often use carrots in my smoothies. They actually help sweeten a smoothie in which there’s no added sugar — and straight-up carrot smoothies with some light-colored fruits to retain that bright orange color, maybe a little ginger or cinnamon, will please your kids or kid at heart, like my husband, Andy. So get ready, get set, here comes another beautiful Meal Box from Farmer Bob thanks to some wonderful, soaking rains…at last. Published in Bob’s Fresh and Local CSA Newsletter, 6/21/2017. If you are interested in sustainable agriculture, and your CSA membership says you are, you probably know that those veggies are a lot easier on the environment and our water resources than animal agriculture — so much so that Frances Moore Lappe suggested in 1972 in Diet for a Small Planet that we would be better served to eat the grains we grow for animals than to feed them to animals and eat the animals. So I’m always excited to bring home my box of CSA veggies! It is one contribution I make to taking care of this beautiful earth. As with last week, we’ll see a lot of greens, wonderful greens, a sure sign that it’s early in the season, and we have many luxurious, fresh vegetable-filled weeks to go. So I want to say a word about greens, but I want to focus this week on turnips and radishes, root veggies which we are also enjoying now. GREENS. Today was a banner day for me. This morning I enjoyed a kale, spinach, soy milk, seeds, fruit and ice cube “Greenie” for breakfast, a delicious way to start the day. For lunch, I enjoyed the rest of my greens from last week, two lettuces, one red and one green, some mizuna, tokyo bekana, and kale, topped with red onion, radishes and walnut pieces and dressed with extra virgin olive oil, freshly squeezed lemon juice, salt and pepper. Be sure to mince the stems and throw them into your salad along with the broken walnuts. Any little bits of veggie waste can go into compost. ROOT VEGGIES & THE ENVIRONMENT. Cooked white beans, roasted turnips, chopped & sauteed turnip greens, olive oil, white Balsamic vinegar, salt and pepper. I just learned this week that of all the veggies, root veggies are some of the easiest on environmental resources. Last week we received two kinds of turnips, white Hakurei turnips and red turnips. I cut mine up, coated them with extra virgin olive oil and roasted them, chopped and briefly sauteed the turnip greens with olive oil, garlic and seasonings, then mixed both with cooked white beans. With the addition of a little more olive oil, white Balsamic vinegar, salt and pepper, I had a lovely dish to eat warm or cold (as a salad). RADISHES are also great roasted. They’re delicious as an unusual side dish or make a colorful addition to a roasted veggie platter. One of my favorite things to do with turnips is to pickle them, Middle Eastern style. Beets thrown into the pickling mixture give the beets their pink color, which deepens with more beets or longer pickling. On the occasion pictured here from last summer, I enjoyed my pickled turnips with scrambled tofu and greens — and beautiful tomatoes included in my box. Next time I make beet pickles, I’m going to try it without the vinegar, let them ferment to get that tangy flavor, which results in a denser population of probiotics. Make a brine of 4 cups water, 1 cup vinegar and 3 TB kosher salt. Set aside. Wash a wide mouth glass jar. Prepare your pickling veggies, in this case turnips, by washing and cutting (peeling for older or larger turnips). Add sliced garlic if desired. Pack the veggies into the jar, and pour brine over the veggies until the jar is filled, stirring the brine as you work to be certain it stays evenly mixed. you may need a small dish held down by something with weight to keep the turnips under water. If you put your pickles directly into the refrigerator, it will take a couple of weeks for them to pickle. Alternatively, let them pickle on your kitchen counter for 2-5 days, and move to the refrigerator when they taste as you would like. I love these spring and summer veggies!